Dr. F. Gordon Mack, a member of the Royal Nova Scotia Yacht Squadron (RNSYS) and past Commodore had Hebridee II built in 1953. He and Hebridee II were one of the founding members and boats of the Nova Scotia Schooner Association. Dr. Mack knew Bill Roué and he sat down to chat with him over lunch one day at RNSYS, he wanted to find a plan for a boat in the 35 - 40 ft range. Apparently, Roué drew a design on a napkin of his Bluenose Junior, which he had created when he was a partner in the Ford, Payne & Roué design shop in New York. 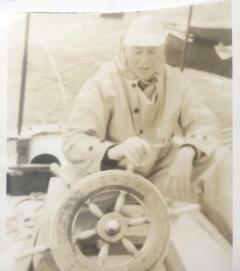 Roué had his office in Dartmouth at the time, and Mack commissioned the schooner to be built in the Weagle Shipyard in Dartmouth in 1952-53 as they were the only boat builders in the local area. The length overall (loa) and the layout were modified from the original drawing and there was another modification made to her design when built or perhaps a mistake; the doghouse was built higher than the design indicated. Dr. Mack decided not to change it as it gave an added bit of protection from the weather in those pre-dodger days, also some of his crewmembers were rather tall and he thought it would be more comfortable. Dr. Mack sold Hebridee II in May of 1975 to Alexander John Hendry. 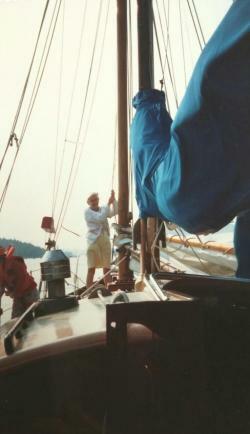 At the time, she still had her original rig and sails – jib headed main, club footed jib, backstays & bowsprit. Edward Murphy, a member of the RNSYS and past Commodore of the Nova Scotia Schooner Association purchased Hebridee II in June of 1977. Under his capable helmsmanship, Hebridee II competed in many NSSA Race Week regattas with a very successful race record. After one of several visits to US waters participating in wooden boat gatherings, Edward and Hebridee II were presented with the 1987 American Schooner Association Award. A very social boat, Edward and Elise Murphy were known to host many friends of sailing in her local waters. Mr. Murphy passed away in August of 2008 and his widow Elise donated Hebridee II to the Maritime Museum of the Atlantic in 2009 where she has been restored to her former glory. Under two racing skippers, Hebridee II’s name adorns many sailing trophies as she had a very successful racing career, she entered the Marblehead to Halifax Ocean Race twice under Dr. Mack’s ownership (1957 - 13th Class B and 1959 - 8th Class D) and twice under Mr. Murphy’s ownership (1985 - 10th Class F and 1987 winning the Cook’s Trophy) acknowledging the vessel with the best cook and the best food. Mr. Murphy was quoted as saying, “In the Marblehead Race, you have to be either first or last. If you come 4th or 5th – who remembers.” At the age of 85, Edward and Hebridee II were the overall winners of the Nova Scotia Schooner Race Week and was also awarded the 2006 Sailor of the Year, honored by fellow members of the RNSYS.